What are the pros and cons of the different ACL graft options, like a hamstring graft, patellar tendon graft or allograft, for ACL surgery? I address this concept in my latest Ask Dr. Geier column. Hello Dr. Geier, I am 48 years old young lady who plays tennis every day, and occasionally I also play basketball and soccer. Tennis is my life, and I also coach my kids. I was playing tennis and fell and torn my ACL. I have done some research and have decided to use the hamstring graft. My problem is that I cannot find a sport orthopaedic surgeon who specializes in the hamstring graft. Every doctor I check specializes in either the patella graft or a cadaver graft. Thank you for the question. I have written about graft options in ACL surgery previously, and I encourage all interested readers to check out my opinions. I perform about two or three of these surgeries per week, and while I utilize hamstring and cadaver grafts sometimes, I as well use the patellar tendon grafts most commonly. I still think it is the gold standard with pro athletes, so it makes sense to me to use it in everyone. Having said that, hamstring grafts are used for most young kids, while cadaver grafts are used for older athletes, and both can be used for other athletes. The main point I want to make with ACL graft options deals with selection of surgeons. First of all, I want to applaud the writer of this question for performing research about her injury and surgery. It seems to me that many patients don’t think about their injuries enough and don’t ask enough questions. That can lead to bad situations where patients are surprised that recovery takes longer than they expected or they hurt more than they expected. In general, I want to encourage all of you readers out there to ask questions and know everything you can about your surgery and rehabilitation. After all, it is your body, and you need it to be as healthy as possible for years to come. Second, I would point out that surgeons are all going to have biases. Obviously I do, as I pointed out in the earlier paragraphs. 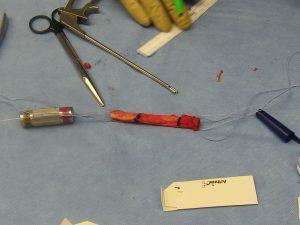 I would have a patellar tendon graft if I tore my ACL, and I say that based on experience and scientific literature. When an athlete goes to see a surgeon, she should ask about options and get information that helps her make a choice. In this case, the reader should ask the surgeon about graft options and find out about the risks and benefits of them (like I discuss in the post about graft options). With that information, the patient can make a decision that is best for her. If she feels that the surgeon is forcing her to pick what he wants to do and she isn’t comfortable with that option, she should find another surgeon. Lastly, with ACL surgeries (and many other sports medicine and arthroscopic surgeries), the outcome depends more on the quality of the surgery and the technical procedure than on the ACL graft options. In this case, surgeons that perform 100 or more ACL reconstructions per year are usually familiar with all grafts and can easily use any of them. In my experience, while we might choose to use one more frequently, those of us who do them frequently are good at all of them. The surgeons who don’t do them very often are usually only good at one technique. And there are far more surgeons who perform these surgeries 20 or fewer times a year than ones who perform 100 or more. The technical skill of the surgeon and the quality of the physical therapy seem more important in overall outcome than does the graft selection, in my opinion. Are our jobs contributing to the national obesity epidemic? Episode 45: What is the best way to stay hydrated? Episode 71: Can exercise be detrimental to weight loss? This audio/video program offers a comprehensive Q&A collection on ACL injuries, including diagnosis, graft options, partial vs. complete tears, rehab, reinjury, recovery and return to sports. Understand your ACL injury and your treatment options even if you have no medical knowledge and have looked everywhere for answers with no luck! Recover From Knee Surgery Like a Champion! Take steps to recover from knee surgery quickly and safely! This course teaches you what to expect and how to prepare for surgery to have the best outcome.